Metapost: Mic-droppin’ comments of the week! Despite the valedictory nature of this anniversary celebration I’ve thrown for myself, I am not stopping blogging, as a few worried correspondents have asked. Far from it! 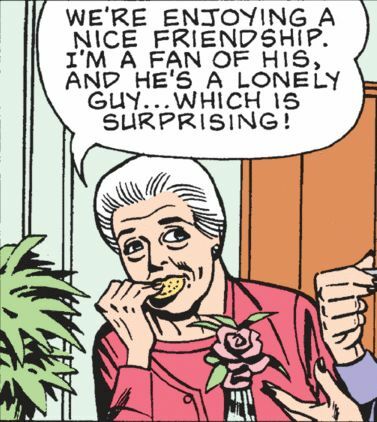 I will continue to make jokes about Mary Worth until the newspaper strips, the Internet, or I cease to exist. I will, however, be taking the next two weeks off to bask in my own glory, celebrate my 40th birthday next week, and put the finishing touches on my long-overdue novel. Your comments of the week will be up shortly and then you’ll be in the gentle, capable hands of Uncle Lumpy until Monday, July 28th. There are major Josh life changes in the offing, though: Amber and I are moving to Los Angeles at the end of August, where I will be attempting to break into comedy writing and performing in as many hopefully paying forms as possible. If you’ve got a yen to work with me, or if you have the inside scoop on a reasonably priced two-bedroom apartment in Silver Lake or thereabouts, drop me a line. What over the past year has been worthy to share the stage with these greats? Well, I was pleased with the first Mark Trail plot of 2014, a test-drive from new Mark Trail scribe James Allen. A pelican leg band led Mark to saintly Jessica the avian biologist and her evil boyfriend Marlin, who was in league with local turtle murderers. 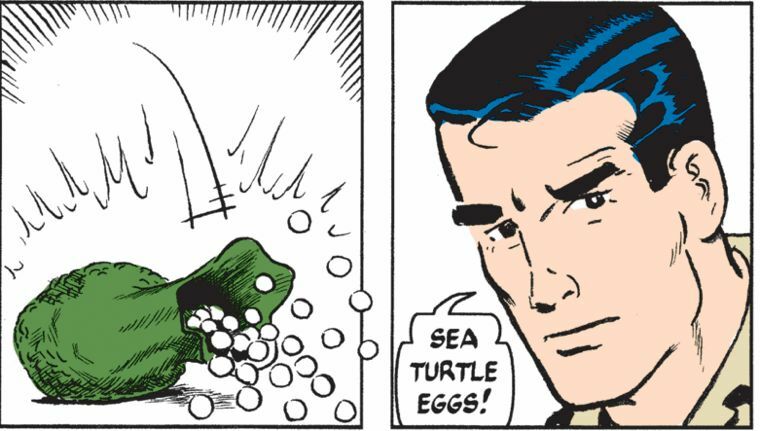 Marlin was poaching sea turtle eggs, which is a thing that happens, I guess, which naturally led to fisticuffs. Mark paused the violence long enough to mourn. 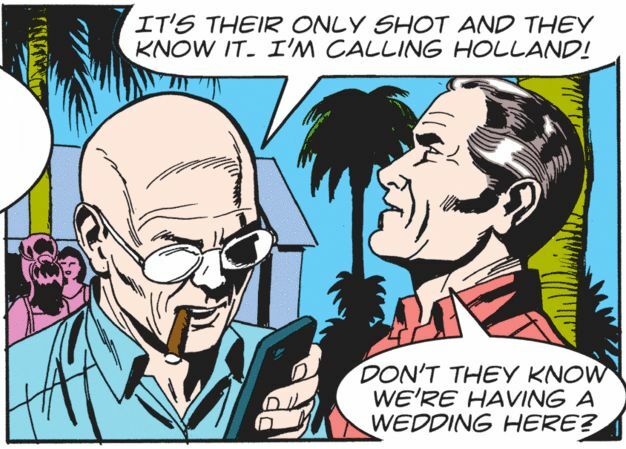 Mary Worth briefly left her California home and supposed boyfriend Dr. Jeff to travel to New York City! Ostensibly she was there to see her friend win a major award, but she ended up spending most of the trip hanging out with handsome Broadway legend Ken Kensington, going to art shows and eating thin-crust pizza and other New York stuff. Ken tried to make Mary fall in love with him with his mind powers, and Mary couldn’t help but notice his need for a woman in his life, and also briefly turned into Gollum. She almost decided to stay, but then nearly got hit by a car, which is as good a reason as any not to dump your boyfriend, I guess. 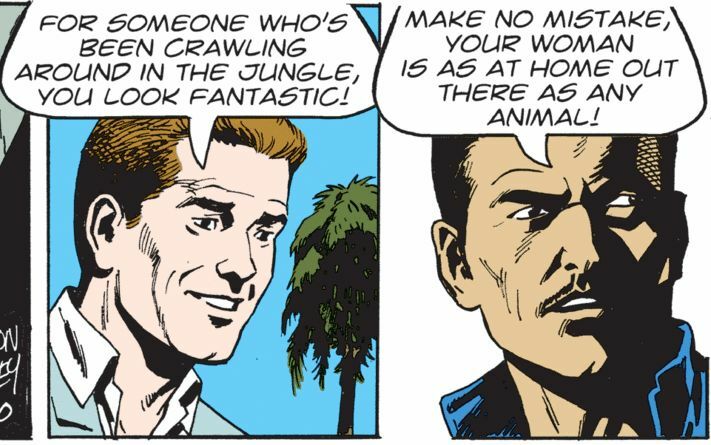 But I have to say that for Blog Year Ten, my heart has been won over by Judge Parker’s epic, slo-mo tale of love, marriage, screenwriting, and privilege on the high seas and/or in the jungle, which has been happening for literally the entire year. 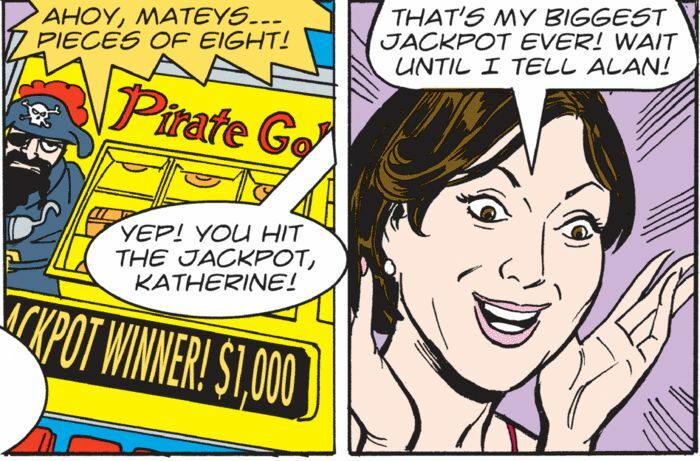 It’s been full of great moments, like: Katherine going bug-eyed with glee as she wins another few thousand dollars to add to the family vault! April telling her husband-to-be that yeah, she’s going to kill some people if America needs some killing done, so he’d better get used to it! 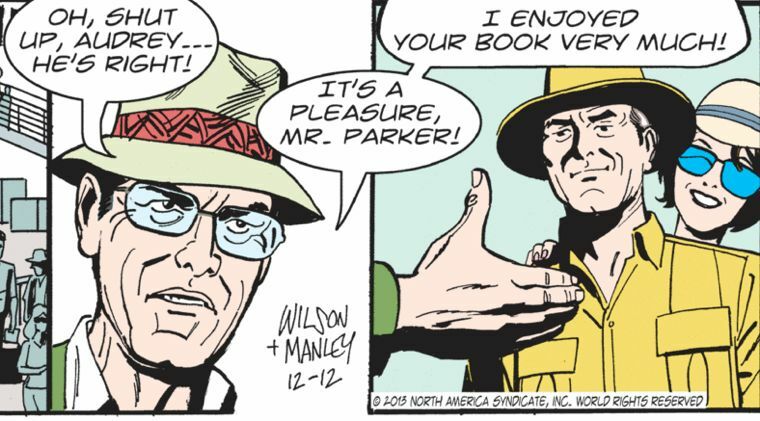 Judge Parker Senior humiliating some egghead academic who dared to give his terrible, unreadable book a bad review! Judge Parker Senior making friends with a snake! The first appearance of April’s dad Abbott, a delightful Hunter S. Thompson lookalike with a pet tarantula! April’s dowry: some totally illegal diamonds that would get Randy into a bunch of trouble, if it were possible for bad things to ever happen to a Spencer-Driver-Parker! An assault on Abbott’s jungle compound by his enemies, mere moments after Randy and April’s wedding, much to Judge Parker Senior’s disgust! 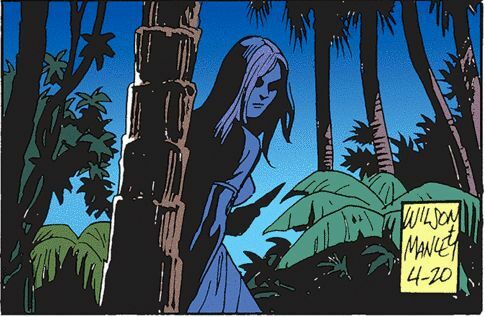 April heading out into the jungle in her wedding dress to do what she does best, which is to straight-up gut people like a fish with her huge knife! Whoops! Don’t worry! The bad guys love Judge Parker Senior’s book! Everybody is saved! And Randy is justifiably aroused! Thank you for ten great years, everybody! I feel as rich as a Spencer-Driver-Parker, thanks to all of you. Be nice to Uncle Lumpy and I’ll see you in a couple of weeks!